Xcel Energy has presented Kraus-Anderson’s Twin Cities headquarters building with its High Performance Building Award, recognizing leadership and ongoing commitment to energy efficiency. KA was selected from the pool of 2017 Finance & Commerce Top Project honorees that have participated in Xcel Energy’s Energy Design Assistance (EDA) program. The program provides computerized energy modeling to identify various efficiency measures available, potential costs, payback terms and rebates. KA worked with Xcel Energy’s EDA program to maximize energy saving opportunities that complemented the style and design of its five-story, 100,000 s.f. office facility, completed last year in downtown Minneapolis. 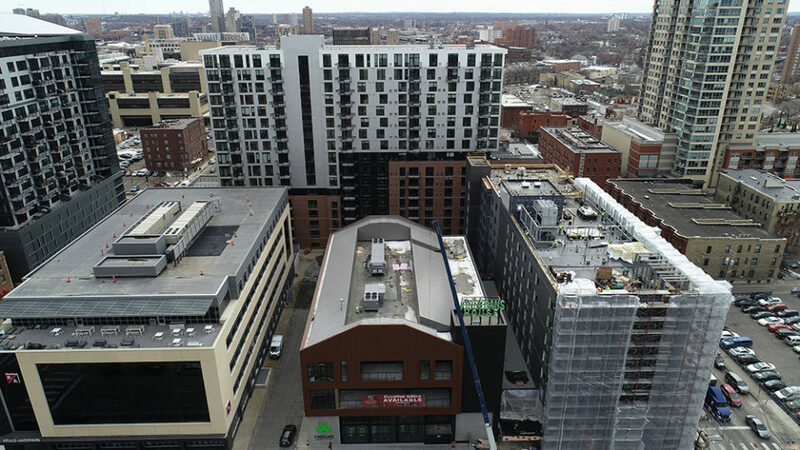 The new office building is part of a block-wide development that includes high-rise housing, a boutique hotel, non-profit micro brewery and two levels of underground parking. The entire block is intended to create a unique urban experience within the heart of downtown that, taken as a whole, represents a sustainable addition to the city of Minneapolis. The KA office building, left, is part of the KA Block development. Kraus-Anderson leadership determined the guiding principle used throughout the project would be “cost-effective sustainability.” This principle influenced all decisions including space planning for customers and employees; building components, systems, and technology; and construction means and methods. The building just received LEED Silver status for sustainability. Kraus-Anderson began the design and programming process by inviting employees to participate in the planning with 12 focused committees. Over 100 KA employees participated, providing direct input and guidance into numerous building amenities, technology, workstation configuration, sustainability initiatives, among other features. “The entire design and construction has been very thoughtful, from the building configuration to the air quality, making this an inviting and invigorating environment,” adds Hille. 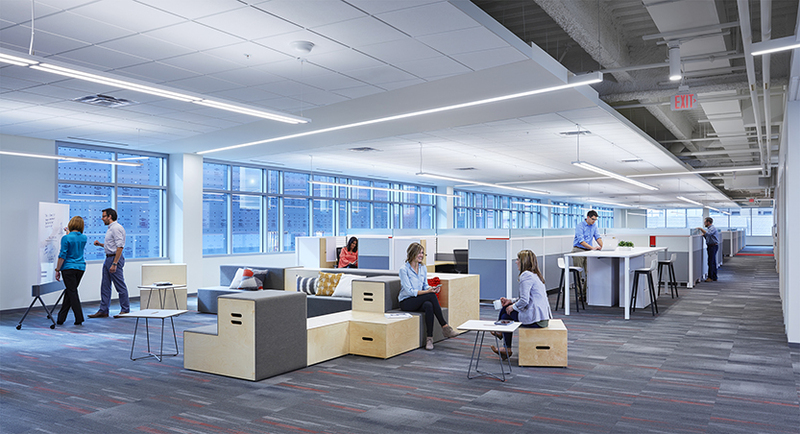 A top priority was a collaborative, open space environment, and using as much daylight as possible. Conference rooms, smaller private phone rooms, and specialty workrooms are in the middle of the building, with offices and open space around the perimeter. Lower partitions allow for employee collaboration as well as letting daylight reach further in toward the center of the building. The windows for a majority of the building use both continuous ribbon-glass configuration as well as a glass curtain wall system to provide maximum daylight. The window glass tint color is dark enough to limit solar heat gain to reduce the air conditioning load, but light enough to provide enough daylight to enter the building to reduce the need for additional lighting. The same tint works to limit solar glare which improves comfort by reducing eye strain. The electrical lighting consists of direct/indirect and pendant style energy efficient LED light fixtures. 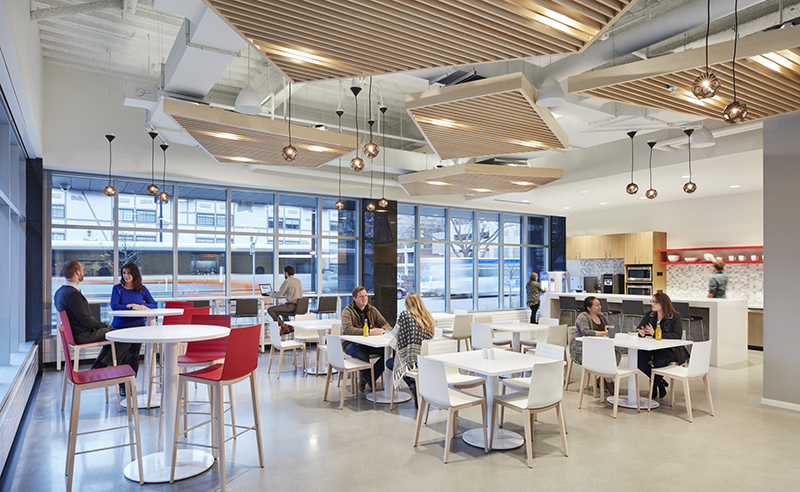 Continuous linear lensed strip LED light fixtures are used in a diagonal pattern throughout the building at strategic locations to add unique architectural interest. Daylight harvesting controls are used to save energy for the lighting by automatically reducing the light level output when sufficient daylight is available through the building windows. Indoor air quality was also a big priority. They chose low off-gas emitting characteristics in all of their interior finishes for flooring/carpeting materials, wood wall panels, and paints/adhesives. Finally, the new building includes amenities that previous offices never had: an employee KAfé with large windows to capture ample daylight, a multi-purpose training/conference room, a pre-function break-out space containing a service bar, a catering kitchen, and an employee fitness center with locker rooms. And a large outdoor patio located on the 5th floor is the perfect spot for staff to enjoy fantastic views of downtown Minneapolis. Everyone loves the new building, though there’s debate over which feature is the best. “Everything has been so thoughtfully created, from the building configuration to the air quality, to make this a welcoming and invigorating environment,” adds Hille. The measures earned Kraus-Anderson Energy Design Assistance program rebates of more than $146,000 and will save them an estimated $80,000 per year in energy costs. Stringfellow meets with his Xcel Energy representative on a regular basis and says he’ll continue to look for other improvements to be made over time. “We own the building and since we are a real estate company, we’ve taken a close look at long term effects but we know there will be adjustments we can make over time to save even more energy and money,” Stringfellow says.